Happy October! This year is really different. It’s pretty crazy. Last october I was miserable and really sad about a lot of stuff. This year I have different reasons to be miserable, so the fact that I don’t have to continue being miserable about the same things is great. I don’t want everyone to leave and for me to be left alone here. Everything that happens to me, and everything I do because of it, is because I have no choice. I really wanted to go to Marche by movenpick, WIP, and Plan B. Even if I get a chance to go to Alexis it would at least be something! I can’t believe i’ve been using my laptop for 4 years already. Raya Haji is this weekend. Where will everyone sit? Or rather, who will actually come? What will they eat? 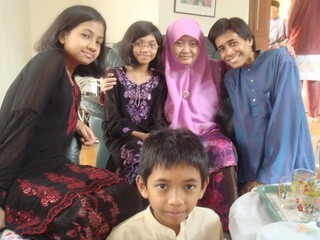 I can’t believe this is a raya photo from 5 years ago. I wonder if everything really was as simple as it seemed back then.